Tooth & Nail Winery along the 46 West wine trail in Paso Robles brings gothic charm (and a moat) to the experience of tasting very good wines. 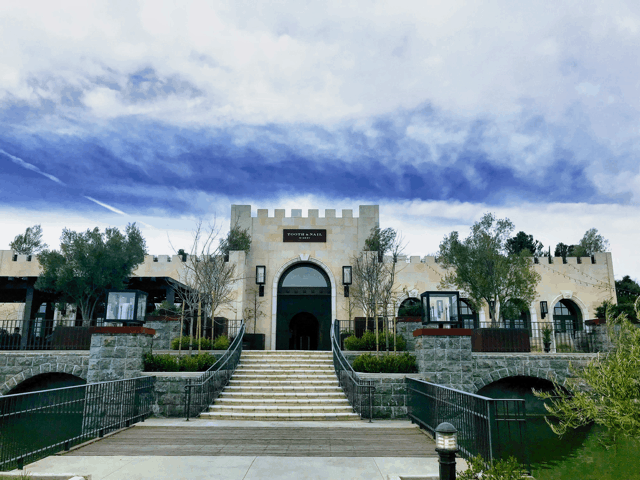 Unconventional winery: The castle (complete with moat) setting of Tooth & Nail Winery blends a fun, gothic feel with some great wines. Before the event started, we did a quick wine tasting. Two of our favorites from the Unconventional list (really, that’s what it’s called) by winemaker Jeremy Leffert were the 2015 Amor Fati Cabernet Sauvignon and Pinot Noir. 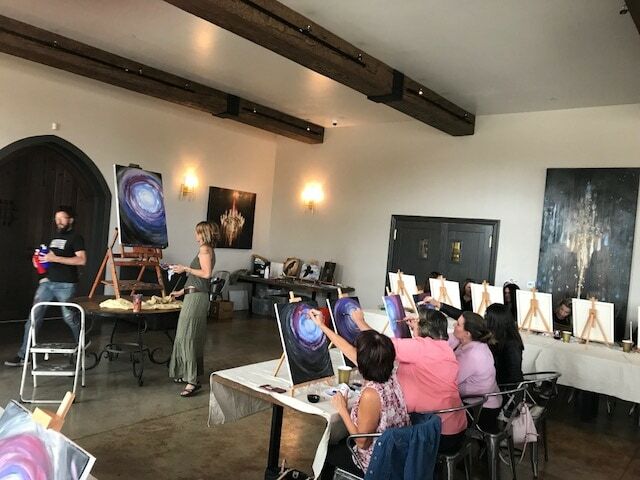 Unconventional theme for the featured painting: We’ve attended other wine-and-sip events (all fun) and the painting chosen by the teacher is often a landscape, seascape, an O’Keefe-esque flower, or other calm and pleasing artistic imagery. But the painting depicted in the social media ad for this event? Thorny brambles growing out of a Gray’s anatomy heart, and a pair of crows coming home to roost. Not exactly the normal Valentine’s fare. Be still my beating (?) heart. This is the painting we were expecting to create. 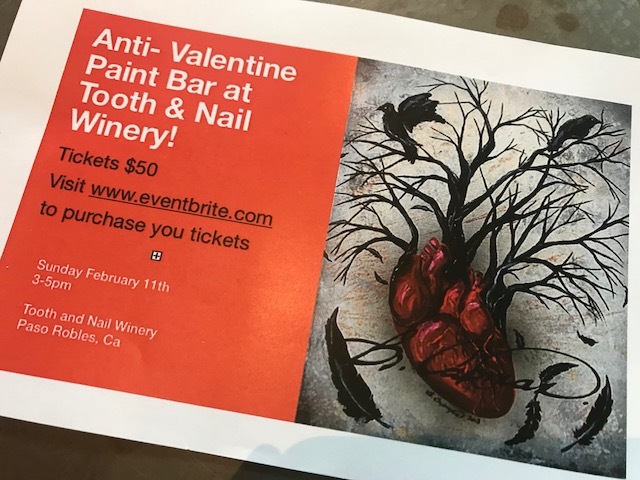 So sign up we did, and it’s a good thing, because nearly every seat in the window-flanked hall was taken by fellow adventurers out to create some art, have some fun, and enjoy some wine on the Sunday before Valentine’s Day. Before we dive in, we want to say right up front that we’re not artists. We both enjoy art—sketching, painting, pottery, whatever—but we’re not artists. And that is the beautiful thing about an art-and-wine event. No artistic talent is needed, not even if “can’t draw a straight line” is your self-described ability (and you’re probably selling yourself short). A good teacher will guide you through creating your own rendition of the painting, and believe us, it will be beautiful. We found two seats near the windows, so the light would be right (to film the art-making in time-lapse mode), and got our two glasses of wine (to aid in the creative process). Not sure, but we think our wine was The Fiend—perhaps a nod to a Right Bank Bordeaux blend of 72% Merlot, 18% Cabernet Sauvignon, 11% Petite Syrah. Whatever it was, it did help the creative juices flow. 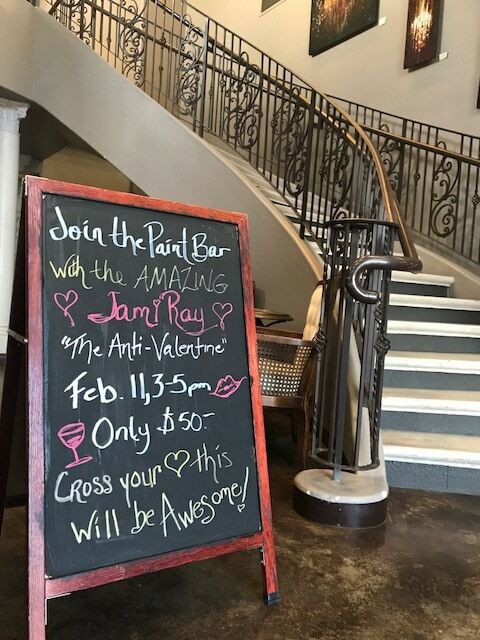 Right this way to the Anti-Valentine Paint Bar. Interesting, too, the paint for this painting. 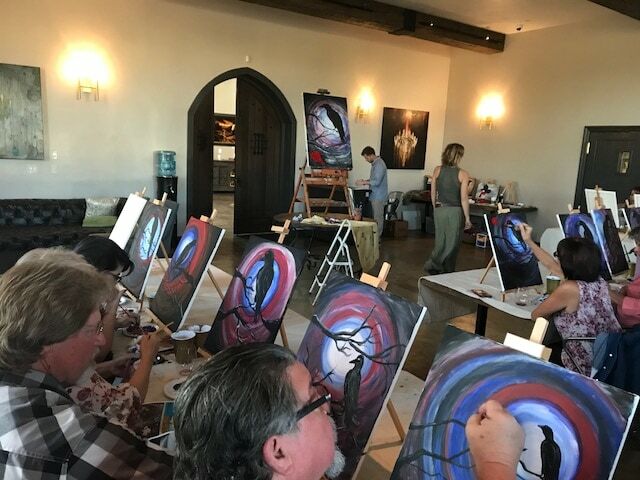 Some wine-and-art experiences provide a rainbow of acrylic colors to use. But this one had just four on our palettes: white, black, red, blue. It was a nice chance to experiment with blending our own colors. As the large class settled in, nervous laughter quieted as co-teachers and artists Jami Ray and Josh Talbott introduced themselves and explained what we’d be doing today. Unlike some other paint bars, Jami and Josh did not have a finished painting at the front of the room for students to refer to. Instead, we created brushstroke by brushstroke with our teachers. And, here was a surprise. Our painting ended up without the freshly plucked heart as was shown in the ad. Personally, I was a bit pleased with that. Not that I can’t paint a human heart in the name of fun and creativity, but I’m not sure I would have enjoyed looking at that painting every day, and it may have been destined for the thrift store and someone’s more goth-influenced decor. Jami first showed us how to create the light source that would be the focal point of the painting. Starting with white, then mixing in some blue, we blended it out to create a sphere of light. With the addition of red, the blue blurred to purple and the purple blurred to black infinity at the edges of the canvas. 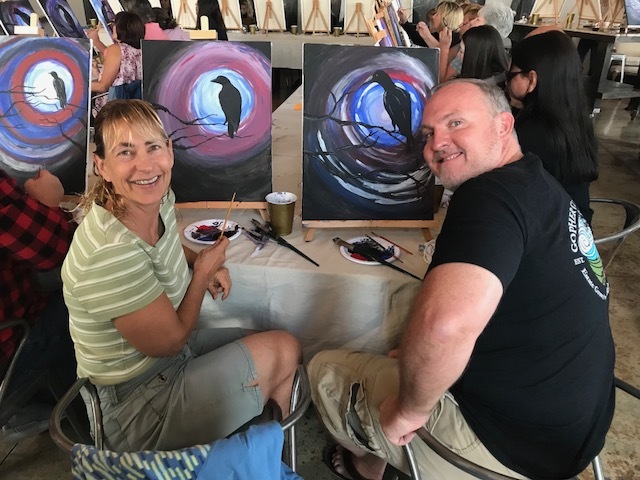 Jami Ray and Josh Talbott walk us through creating our crow(d) pleasing masterpieces, with patience, humor, and talent. Next, the branches came to life, squiggling in from the edges and scratching toward the light. Gnarled and bare, they formed a place for our crows to land. His inky teardrop took shape above a branch, and our renditions of teardrops began to flow on the canvas. Crow after crow was born, each looking at something just off the edges of the canvas. Some looked left, some right. Some looked straight into the light. Josh explained how tail feathers are long and pointed, and he showed us how to add definition to the shoulder, the beak, the feathers along the wings, and to give our crows legs with which to grasp the branch. Crow by crow, the room filled with art. Each canvas now a masterpiece reflecting the creator’s eyes, heart, and hand. 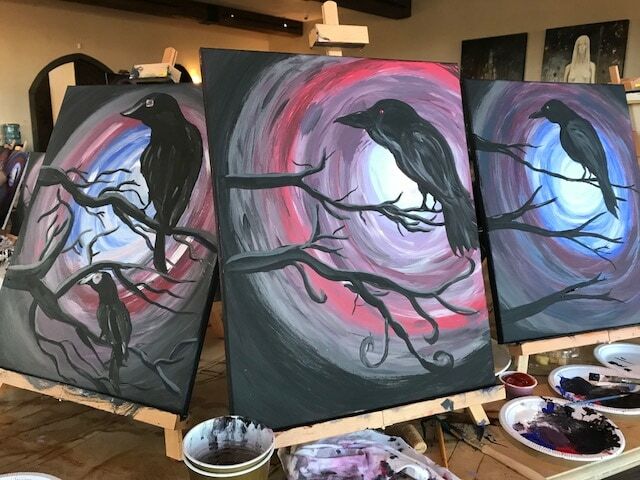 Crow by crow, the paintings come to life. In a flash, two hours are gone. And gone with them is the nervous laughter that began this experience. It’s been replaced with smiling faces, energy filled with “yes, I did this,” and an unspoken appreciation of tapping into the place of creation we are all born with and listening to the whisper of the artist that resides within all of us. Every painting is a masterpiece, reflecting the artist’s heart, eyes, and hand. 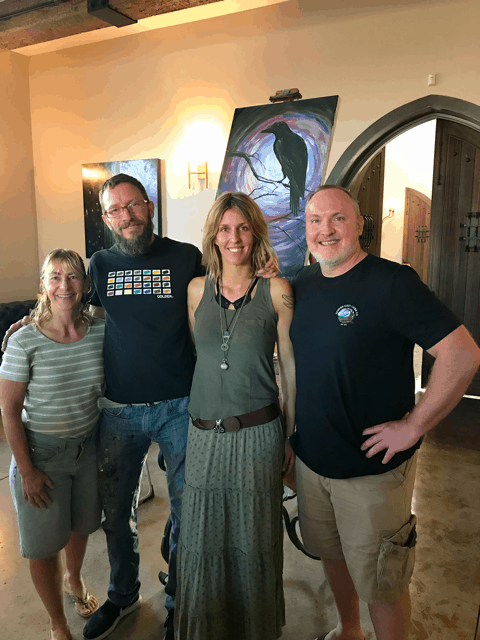 Thanks to Tooth & Nail Winery (www.rabblewine.com) for the amazing setting and wine, and to our patient, positive teachers Jami Ray and Josh Talbott for sharing your talents so all of us could unveil the painting we had inside us. The Flavor Team with our finished pieces. Such a fun experience! Thanks, Jami and Josh, from Kara and Andrew (the Flavor Team)! PS. Flavor Tribe! We’re planning a Great Flavors wine-and-art event. Let us know if you’re game, and we’ll keep you posted about the details.